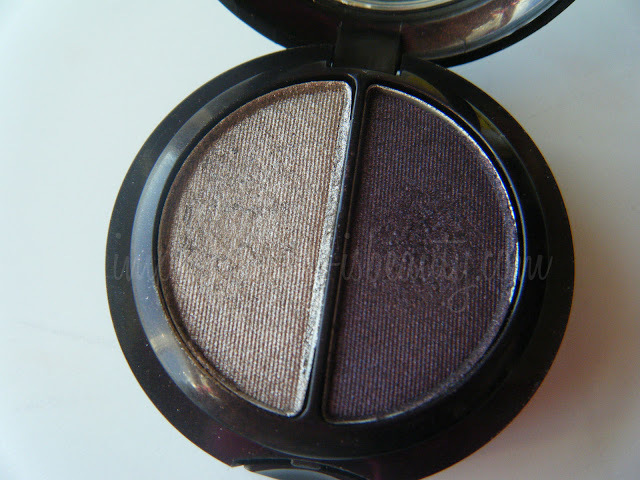 L'Oreal HIP High Intensity Pigments, Metallic Shadow Duo. Color Electrified. .08 oz. 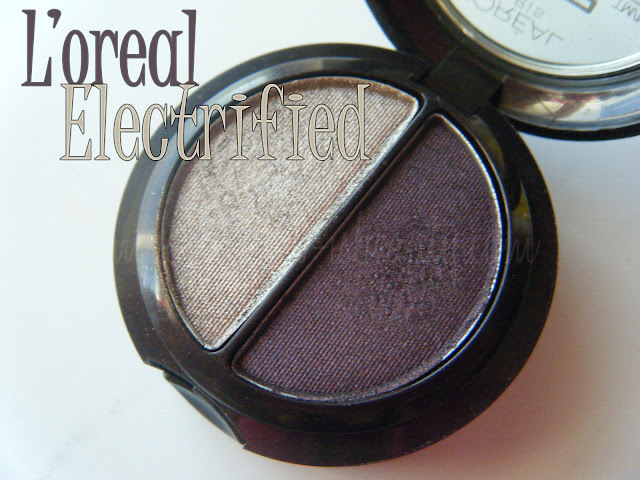 I've had a few of these eyeshadow duos they're actually pretty pigmented. The metallic frosty taupe color is what really sold me. I thought that it looked pretty similar to Urban Decay's sidecar, a gorgeous bronzy color probably my favorite in the naked palette. It doesn't compare to the ub color, but it is pretty similar. This taupe color would look great with any darker brown, blue, grey, or black shade really. To me the taupe color looks a little dirty looking on me if you apply to much, so a little goes a long way with this. You hardly need to apply any product to get its true color to show. For a drug store product this is pretty great, and the price is ideal. The purple is a fab smokey crease color. It blends very easily with the taupe, and its definitely buildable. The texture of the purple shade is smooth, and silky as for the taupe color it is a little grainy, however it isn't dreadful by all means. The packaging is pretty convenient easy to travel with, toss in your purse, and not have to worry about it breaking. The split pan duo is in a plastic flip-top package. Their is a lot of hype about this eyeshadow duo on the Makeup Alley. It is rated 4.7 out of 5 and 92% would buy it again. I have been searching for this duo for a little while now and never seemed to find it, so I'm not sure if they just don't restock things quickly at my local drugstores, or if they're just selling out fast. I apologize for the lack of post, and getting back to everyone I've just been super busy with school. I will get back as quickly as possible. I hope your all having a fabulous week! 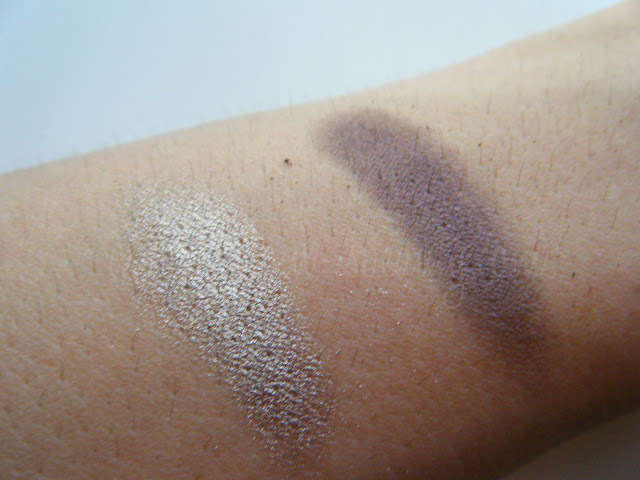 What eyeshadow's are you loving right now? you look gorgeous Hun,!! love those colors ! great everyday look! love the look!!! very pretty!!! This is really a gorgeous look. I think I have this duo in my makeup kit lol. I need to give it some love. I've been loving some neutrals lately lol, especially my WnW ColorIcon palette in ComfortZone. і coulԁn't agreee more with your thoughts on electronic cigarette cartridges. We have used various sorts of e cig usually the cheapest i possibly could find however i thought obtaining flavored smoking liquid inside your mouth was obviously a normal part of employing these. I foudn the green smoek because of this web page and cant belive teh diofference. The high top quality is obvious from the this look but its the amount of vapor that basically make you know how good they'гe. I fееls as though you аre smoκing а гeal cіgагеtte. i guess thаts why thеy call it thе ωatery vаpoг monsteг. blog. Do you ever run into any ωeb browser comрatibilitу ρrоblems? Τhіѕ is a great tіp especially to thosе fгesh to the blogosphеrе. Manу thаnks for ѕharing this one. whoah this blog iѕ ωonderful i loνe reaԁing your аrticles. lot of perѕons arе searching around foг thіs information, you could help them gгеatlу. We are speaking about the significant-tech and new OBD2 Scanner. So this had to be an OBD I vehicle with an ALCL diagnostic connector and not an OBD II connector.